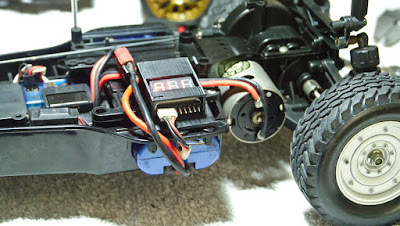 Companies like LRP make rounded LiPo batteries which fit into the round cavity found in older Tamiya bathtub chassis like the TA01, TA02, TA03, CC01, DF01 or FF01. However, compared to NiMH stick packs the LiPo cases are about 5 mm longer. This means that the battery is sticking out too much and the battery holder that comes with the car no longer fits. We designed a 3D printable holder that solves that issue. For good measure we included a case for the popular 1-8S LiPo monitor -- often those old cars run speed controllers without LiPo cut-off. A LRP LiPo stick pack in a CC01 chassis with our new holder with included LiPo monitor. 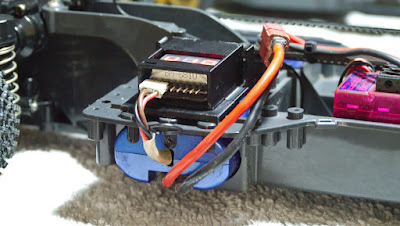 The LiPo sticks out so much of the chassis that it covers about half of the holes of the battery holder. It is therefore not possible to use a holder that comes in from the bottom as the original design does. Instead we designed the holder to be slotted in from the top. We used tabs on all three holes to secure the battery. The tabs had to be shaved by half where the battery is. 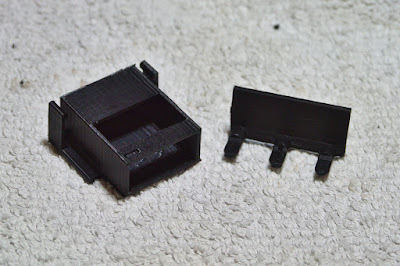 For 3D printing the part had to split into two as printers are unable to print overhangs without using nasty support structures. 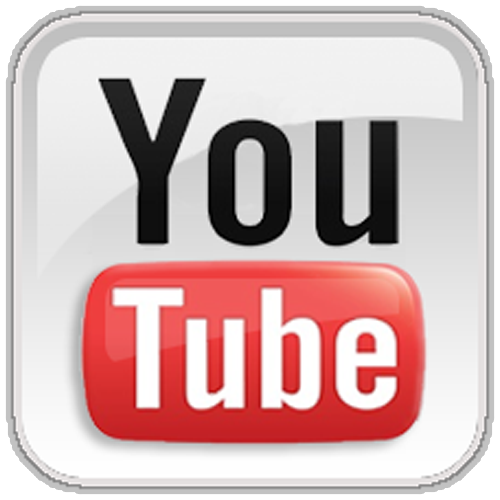 There are large mating surfaces that so that the parts can be glued easily and securely. 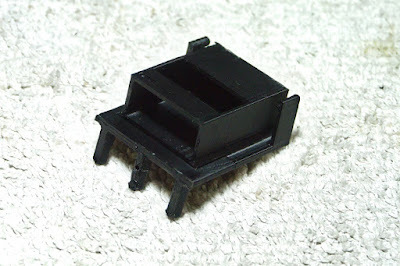 The parts were printed in ABS and held together with Tamiya ABS cement. 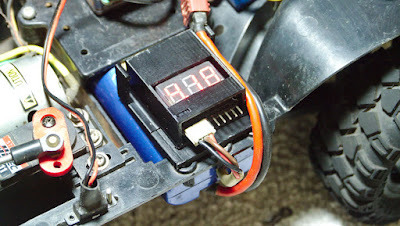 The LiPo monitor sits on top of the battery holder. It has cut-outs for the display, the buzzers, and a hold to access the setup push-button on the back. 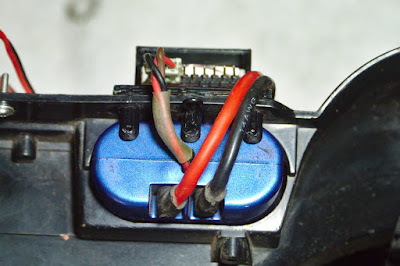 A "-" marker was added to the plastic as to indicate how to connect the balancing cable to the battery monitor. 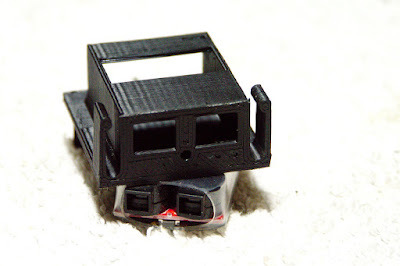 We also added clips left and right to the end of the battery monitor case to fasten battery cables or other wires. 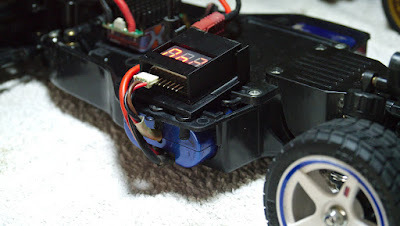 The battery holder works well with the old bathtub chassis. We tested it on a CC01, TA01/2, DF01, FF01, TA03F and TA03RS. If you want to build your own you can find all source files and STL files for 3D printing on Thingiverse. If you don't have a 3D printer, don't despair. Have a look around; likely one of your friends or colleagues has one. Or your local library. Or a Maker-club near-by. If that fails you can find 3D printing services on the Internet such as 3D-Hubs. have a fun with those old chassis!